If you’re interested in contracting you’ve probably seen a fair amount of coverage in the news about the gig economy. These articles usually focus solely on either the downsides or benefits of the gig economy, and portray it accordingly as either modern slavery or the answer to a happy work life. If you’re an established contractor, just starting out or maybe considering if contracting is the right path for you, it can be overwhelming trying to wade through all this mixed information, and it may leave you feeling that success in the gig economy is becoming more and more elusive. We’ve used our own experience with contractors to present what you’ll need to know about the gig economy, what risks you should be aware of and some key tips to succeeding as a contractor. 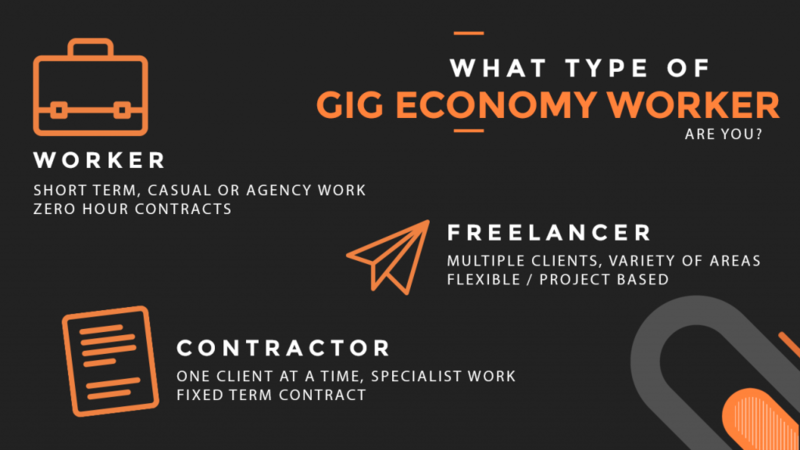 Although people frequently use the term “gig economy worker” for anyone who works on short term projects or contracts, they rarely make any sort of distinctions, whether its between freelancers (multiple ongoing clients, often a variety of types of work), contractors (one client at a time, fixed contract, normally one main specialism) or workers (short-term, casual or agency workers, zero hour contracts). The idea of “gig” work is often portrayed as a new phenomenon, but in reality it has only been expanded by new technology and ideas that make it more easily available to everyone; for example, apps like Uber. Much of the negative press stems from the idea that people are being forced into self-employment when the nature of their work is really as an employee e.g. workers who would prefer not to be on zero hour contracts. However, this does not change the fact that for many highly skilled specialists, contract work is still a viable, rewarding and sustainable way to earn a living. And finding success as a contractor is not as hard as you might think. Before starting any project, you would make sure you understood the end goal, right? It helps you to stay on target, keeps you motivated and justifies your decisions. You should think about your career in a similar way. Consider what you want to get out of your work and how contracting can help you achieve that. Chances are, if you are or want to be self employed, this may be fairly different to the goals of people who prefer full-time employment. Create a list of aspirations and use these to define a success statement. You can remind yourself of this statement when considering new opportunities, feeling unmotivated or struggling with your projects. It will help to remind you that success looks different for everyone, and it is more important to hold yourself to your own standards than anyone else’s. Once you’ve established where you fall in the gig economy and what you want to get out of it, you can then begin to identify the possible risks and difficulties you may face. Being realistic and aware of potential problems means that you can work to prevent or prepare for them. Some may be specific to you or your industry, but we’ve identified some of the common issues or mistakes that contractors make to help you avoid them. For many contractors starting out, a major concern we hear time and time again is how they will manage their finances with an unpredictable income. Of course, one of the main attractions for contractors is that the work is often better paid. A DevOps contractor, for example, could earn an average of £550 a day. If you can manage your money cleverly, you should have no problem compensating for quieter periods of work and other added expenses with the money you earn during busy periods. Prepare for your taxes. This one’s a no-brainer. Whatever you earn, put 20% to one side to cover your taxes. It’s better to have oversaved than under saved when that tax bill comes through. Make hay while the sun shines. Another simple one. Work may be sporadic, and you will certainly notice periods of higher and lower demand. Budget yourself so that the money you make at your busiest will cover you when you’re in a quieter period. Save for unexpected complications. No one likes to think of themselves getting sick, or being unable to work. But as a contractor, you have to be your own safety net. We suggest trying to save enough money to cover your living costs for at least 6 months, or looking into unemployment insurance, to give you peace of mind. It can be hard when you first start contracting to change your mindset from that of an employee to someone who is self-employed. But thinking like an employee can be detrimental to your contracting career. Once you understand that you are not dependant on others for your income and take full responsibility for your own career, you will feel more confident. Try and run yourself as a business, considering all areas that a traditional business would have and adapting them to yourself. Have you got a plan in place for managing your finances, marketing yourself and selling your services alongside your everyday work? Many new contractors often take the saying “make hay when the sun shines” to mean they should accept every opportunity they are offered. However, if your aim is for a long term, successful contracting career, this may not be your best option. Be realistic about the work you want to do, the income that it will generate and the experience every opportunity will give you. As a new contractor, you must find the balance between being so picky you can’t earn a living, and so broad that you never define your niche. Another common mistake contractors make is selling themselves short. The fear for many contractors is that if you charge too much, your clients will simply find someone else. What you need to remember is that you have specialised skills that these clients need. If they are going to make you an offer at all, it is because they see you as a good match for their project, and most employers are willing to pay for the right person. Don’t be afraid to negotiate with your clients, but remember to be flexible too. Most of the time you will agree on a reasonable rate that works for you both. At ClearHub, we regularly enter into salary negotiations on behalf of our contractors, and work hard to ensure that they are offered a fair market rate for the specialised skills they provide. Once you’ve mastered the basics of building a successful contracting career, you can begin to look at ways to increase your productivity, value and job satisfaction even further. We know that when you’re self employed, time is money. So we’ve put together some top tips for increasing productivity and saving time. This is a great strategy for improving the way you work, and the chances are you’re already partly implementing it. It involves creating a mental and physical environment that allows you to do your best work, and it helps to keep your personal life and your work life defined. You may be working primarily from home, or working on multiple sites with different clients, but you can still find a way of creating a ‘space’ that works for you. It may be a home office that you’ve set up for the sole purpose of working, or it could be a set of routine you use to prepare yourself for work. It can involve identifying a higher purpose that allows you to connect to your work, or interacting with specific people you associate with work. Essentially this replaces your traditional office, colleagues and routine that subconsciously put you in the right frame of mind to work. Our Head of Innovation, Simon Wood, recently wrote a blog on the importance of reskilling, and it’s something we think every contractor should be aware of. As a contractor, you are your own biggest asset, and you shouldn’t be afraid to invest time and money in developing your own skills. To save time: Register with an e-learning platform, such as Lynda, and leverage the ability to hone your skills around your busy schedule. Another great way to remain relevant is to keep up to date with what’s going on in your industry. Not only would it look bad in an interview to not know about major changes or breakthroughs, but you can leverage the knowledge to help you find new opportunities, or decide what areas to train in. To save time: Use a tool such as feedly, that sends you news updates on whatever topic you choose, as a quick and easy way to keep track of what’s going on. I’m sure most of you have heard the phrase “Your network is your net worth”, coined by Porter Gale to emphasise the importance of a strong portfolio of contacts. For a contractor, these connections can be seen as security for your future. They could provide the chance for new opportunities, become advocates for your personal brand or offer support and guidance when you find yourself struggling. If you’re still in the early stages of contracting, it may be beneficial to engage with an existing network that’s relevant to your skillset. ClearHub offers it’s contractors the chance to get in front of some industry leading contacts, and saves them the time they’d spend managing their own networks. To save time: Try a tool like Buffer, which lets you batch schedule content to post out on your social media. It can help you keep front of mind and engaged with your network, without taking up too much of your time. For many people, the move into contracting is scary. You may feel like you have to give up your security or take a step down. But the reality isn’t scary – contracting is just a different way of working. To be successful you have to accept that you are no longer an employee of someone else, and need to start running yourself and your time as a business. It may mean more responsibility and you may find that you have to develop new skills to be successful. But it can also mean more autonomy, more job satisfaction and often more income. If you’re a technical contractor looking for more opportunities or advice, get in touch with us or take a look at some of the benefits ClearHub offers for contractors. We’ve already helped contractors find positions in companies like Fox and UBS, and we are always looking for contractors to fill our exciting new positions. Do you have any advice for other contractors? We’d love to hear from you! Comment below or send us an email!